Flower Math is the Florist’s Guide to Pricing & Profitability. Make 1 payment of $499 and SAVE $100 Off the full retail price! Click HERE. Choose 2 interest free payments of $249.50 (Still saving you $100 off retail!). Click HERE. Take advantage of the 12 month payment plan at $49 per month Click HERE. Pick the payment plan that works for you and I’ll see you inside the course! It’s my belief that every florist should turn a profit in their business, which is why I designed this course in the first place a little over 3 years ago! Read more about Flower Math here. I travelled to Providence, Rhode Island over the weekend for a speaking engagement at The Floral Reserve and if I had to sum up the experience in 1 word it would be “fantastic”. It’s so much fun to teach in-person and I was gifted with an incredible group of floral pros in the audience. Every single person in attendance was eager to learn and ready to “do work”…which is my favorite combination in a floral audience. There were 29 florists who grabbed a seat in the seminar and we talked about planning for success in your business, pricing for profitability, and I answered as many questions as I possibly could in the time we had together…but what I’m most proud of is the fact that every florist went home with business plans in writing that they can put in motion right away. If you want to put a business plan into motion for 2019, but you missed out on my live seminar, there’s one last chance to do some business planning with me before the end of the year! Click HERE to get my Business Planning Basics Guide and JOIN ME LIVE on Dec. 20th at noon EST in a private Facebook group for extra support so that you can get your business on the right foot for your upcoming success! You can Join the Business Jumpstart for just $20 and you’ll get immediate access to my 8-page Business Planning Basics pdf plus an invitation to JOIN ME LIVE on Dec. 20th at noon EST in a private Facebook group for paid members only. You must sign up before 11am EST on Dec. 20th to take advantage of this offer! A replay will be made available after the livestream if you cannot join me live on Thursday, Dec. 20th. Every course I create is designed to help move your business forward so you can keep doing beautiful work! You’re officially approaching the end of the business year and while the year may be over, this work on your path to a profitable business must continue. 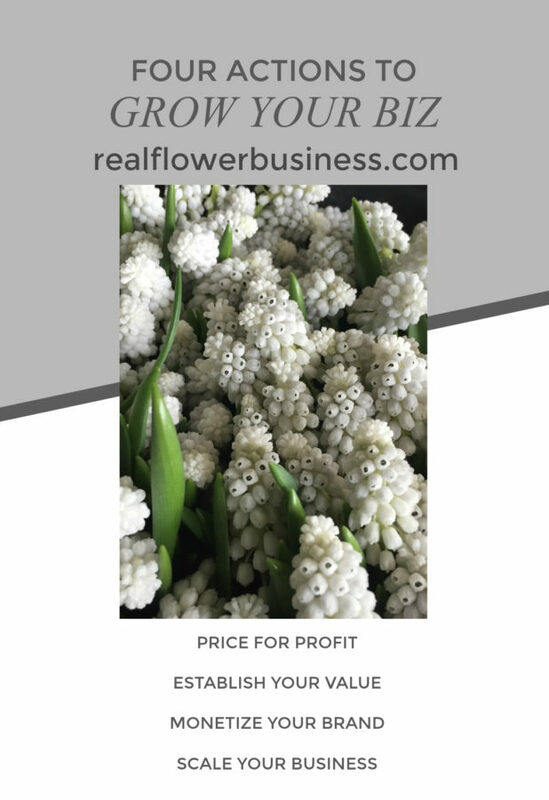 So to support you on that path, I thought it would be helpful for me to lay out the focused steps I teach florists to grow a profitable floral design business. Because the truth is, the biggest problem for most entrepreneurs is they simply don’t know exactly what action steps to focus on to grow their cash flow and scale their business with less effort. This is the process of following industry standard markups, applying a design fee, charging for delivery & set-up, and generally just feeling good about your profit margins. 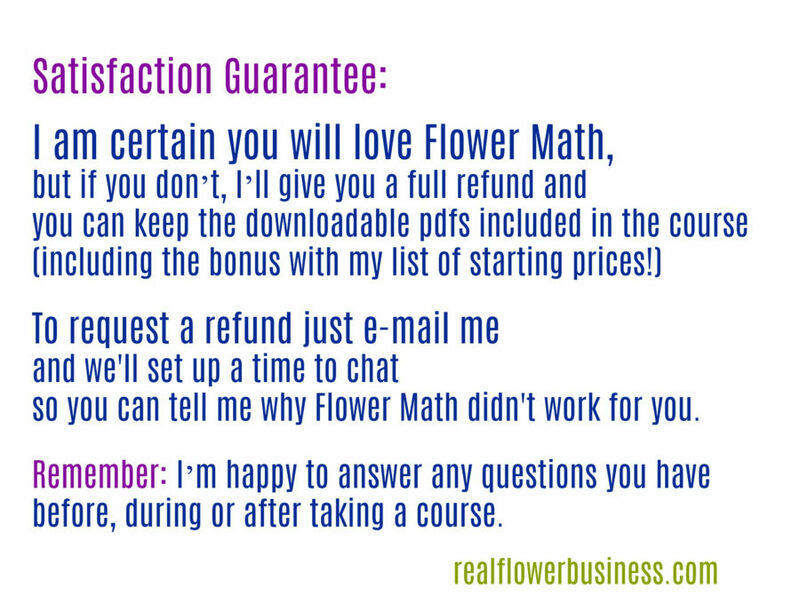 No matter where you are at in business, whether working from a home-studio or a brick & mortar shop, I always suggest you follow the Flower Math formulas for pricing to ensure profitability…(in fact, you can learn more about my Flower Math technique right here!). Following Flower Math formulas will help you increase your income, however you must also think about the long term sustainability of the business. Then, once you’ve built a trustworthy brand, it’s time to tap into it to generate some more cash flow by charging premium prices for the level of service and overall experience you provide. And truthfully, this is as simple as consistently creating beautiful floral designs and providing outstanding customer service experiences so that you develop a sought-after business! You rinse and repeat these 3 steps over and over again until you have your cash flow where you want it to be…where it is more consistent & reliable. This step is focused on the 3 key areas that allow for you to expand your income without expanding your workload. This is the stage when you MUST ditch the hustle-mentality and start thinking and working SMARTER. These 3 key areas are: Clear Offers, Authenticity Marketing, and Streamlined Systems. With these 3 things in place, you will be able to welcome in qualified new clients…and eliminate price shoppers….because clients already understand what you do and trust your brand so that all you need to do is lead them through the process. These truly are 4 CRITICAL focused action steps you need to grow and scale your business. Work smarter, not harder as you grow. P.S. The Flower Math course I mentioned in Step #1 is an easy to follow technique that is making me and my students a lot of money on every order…simply by applying the Flower Math formulas…and there’s no technology required….other than your computer and a calculator. I make a consistent 70% profit margin (or more!) on the cost of flowers & supplies. My clients tell me they make more money on every order they place. Susan made back the purchase of the course in just 1 wedding and said, “I can make a career out of this (and not only be a hobby florist!)”. Canadian designer, Larissa, told me she was happy that she “had to pay taxes for the first time” because she turned a profit in her business after taking Flower Math! In fact, on average the floralpreneurs who follow the techniques I teach are making more money and feeling more confident on the very first order they quote. 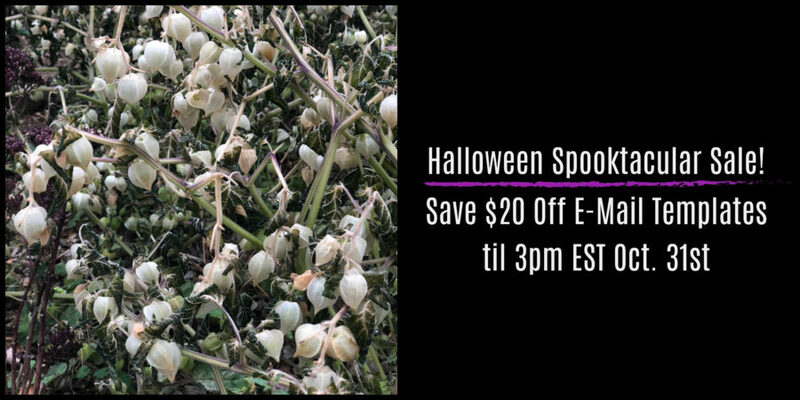 So, if you want to get in the loop on exactly how they work, then click here to learn more and SAVE $100 Off Flower Math Today! 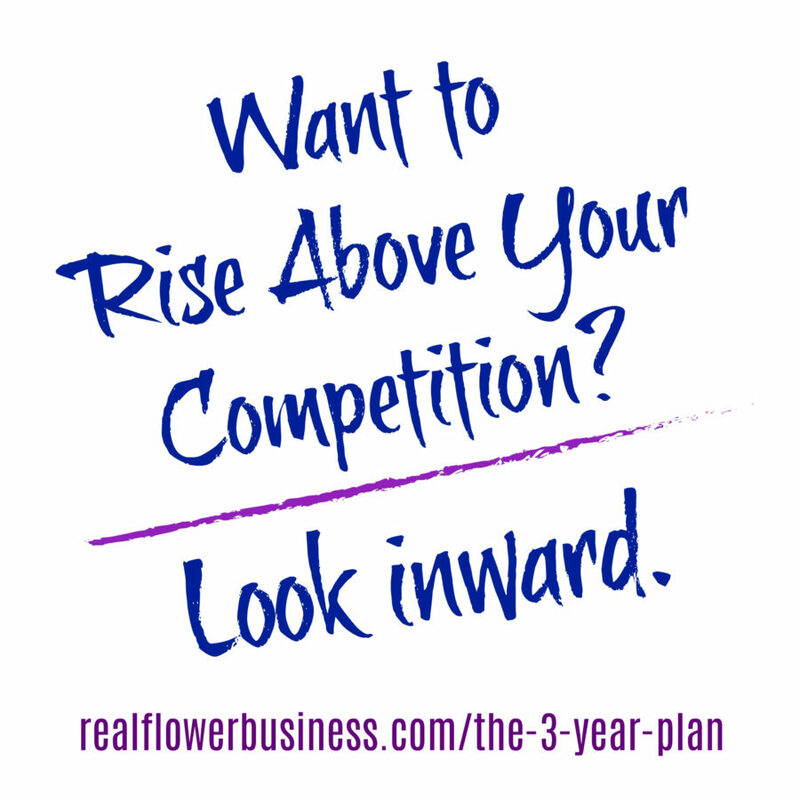 How much do you worry about your competition? Do you follow your competitors on social media and cringe when you see how “great” they’re doing? Are you eager to know “who got that wedding”–the one that didn’t book with you? Does jealousy or comparison creep in and undermine your confidence? What would it look like if you could eliminate your competition? Now, hold on…..I’m not talking about putting other local florists out of business! Your goal should be to “stand out amongst the competition” and the surest way to do that is by being the truest, most authentic version of yourself in your business and your brand so that the right clients choose you! Oftentimes, business owners think they need to hire a branding or marketing “expert” to help attract the right clients, but that can cost tens of thousands of dollars!….really. A “flower famous” friend of mine was quoted over $30k for a marketing expert to help her with her floral business….now, what florist has that kind of money lying around? Not many, that’s for sure. So if you’re working on a limited budget, what are your options? How do you gain brand recognition and attract the right clients? The answer?….there are many ways to develop your brand and improve your marketing efforts and you can do it yourself if you’re willing to dig deep and do the work. You don’t have to be a marketing expert to have a good brand and stand out amongst your competition….but you do need to do some “brand exploration” to get to the heart of what makes your brand special so that the right customers continue to choose you over someone else! This is the work we do in my course, The Art of Good Business! And for students who are enrolled in The Art of Good Business before Oct. 22nd you’re getting a bonus! I’m hosting a BONUS 4th Quarter Biz Planning Jam Session to help jumpstart you end-of-year plans and THEN I’m going to walk through the entire course with you, LIVE IN JANUARY in our private Facebook group. This biz jam session is happening Oct. 22-26th and if you want in, you can apply for a free scholarship HERE ($1,000 value) or click HERE to sign up for the course today! If you’re a floral designer who…. Then The Art of Good Business was made for you! So if you’re ready to zero-in on your ideal clients and move your marketing efforts to the next level, keep reading for more info or click here to sign up! In The Art of Good Business you’ll learn how to focus your marketing efforts and take your website from beautiful to functional by honing the voice of your brand so that you can prequalify leads and attract more clients that love you. Who’ll benefit the most from The Art of Good Business? however, if you’ve been in business for 5 years or more and want to refine a clearer branding message to attract better clients, you’ll have the most to gain from the lessons inside the course. For people who are enrolled in the course, I’ll be leading a power planning session in October(to put some foundational plans in motion! )…and then I’m going to jump in with more live coaching for the entire month of January in our private group–like a bootcamp for boot strapping biz owners….it’s gonna be good. and it’s definitely not for everyone. Don’t sign up if you’re not willing to get out of your comfort zone and “do work”. You’ll have to take action to get results. I’ll be there to help push you over the finish line, but you have to take the first step to get started (read more)! It doesn’t matter if you’ve been in business for 3 years, 3 minutes or 3 decades…nothing defines your brand more than the experience you create for your customers. The most important thing I’ve done for my floral design business over the past 15 years is work towards perfecting a customer service experience that reflects the values of my brand and speaks directly to the heart of my ideal clients. I’m not a traditional “branding expert”, but I have studied and practiced (and practiced) my own approach to branding since I started my business in 2001. It’s said to take 10,000 hours of “deliberate practice” to achieve mastery in a field. I’ve easily exceeded that quota as I’ve worked on mastering my brand. Join me on a brand building journey to help you hone your voice. You can get a sample preview of the course HERE.